Framework is 1″ O.D. steel tubing. Base is 2″x2″x1/4″ steel angle. Can be folded for shipping or storing. Steps are 24″Wx7″D. Top step is 24″Wx10″D (20″ deep top step is available). Horizontal distance from rear of base to vertical support is 32″ (8-12 step), 20″ (6 step), and 14″ (5 step). 4″ rigid casters on rear, 4″ swivel casters with SafeLock on front, and 2-1/2″ diameter rubber pads on legs. Series 4000 ladders meet applicable OSHA and ANSI standards. 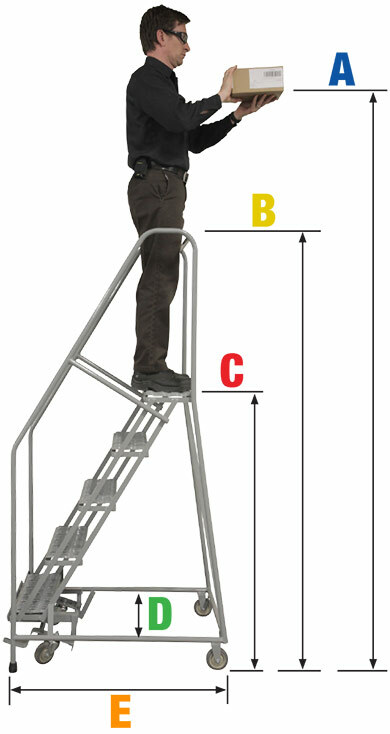 The Series 5000 ladder comes with 24″ wide steps. with 4” wheels. 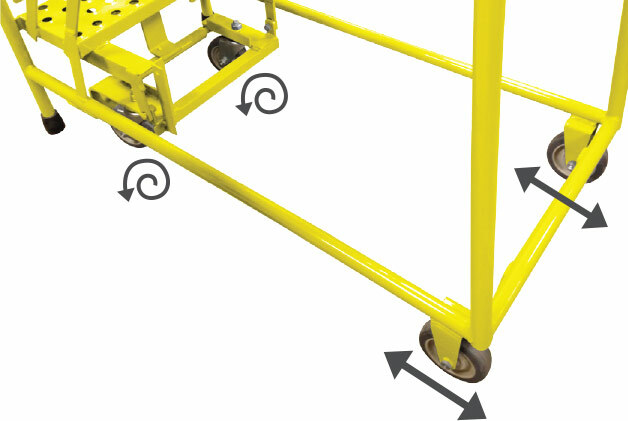 Foot-activated locking mechanism with swivel casters and rigid rear wheels. Standard on all Series 5000 models.